I'm always amazed at the creativity of the people living in and around Austin and San Antonio. Maybe it comes from the days of the Republic of Texas and the spirit of self reliance that this states rich history creates. Modified shipping containers can make a durable and tidy workspace. In the spirit of self-reliance I have seen some very creative uses of shipping containers in Austin in San Antonio and I thought I would share a few with you. Shipping Container workshops. Shipping container workshops are both secure and a great use of space. 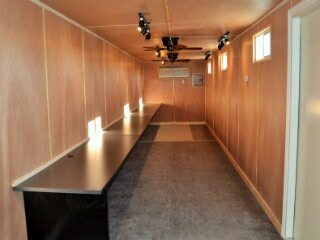 A 40' shipping container gives you 320 square feet of workspace; it's perfect for a wood shop or just a place to tinker. Shipping container used as an art studio. In this instance I have seen a 40' High Cube made into a place to both view interesting works of art as well as a a space for the artist to create. Shipping container sound studio. This is my favorite application, I have seen two different studios built into 20' shipping containers. While they are too small for the band to actually record in they a perfect place for a sound engineer to mix the master the recordings. These are just a few of the creative uses I've seen in Austin and San Antonio in the last couple of weeks, if you see something you'd like to share follow us on twitter at @boxpert. Thinking about a shipping container workspace? Email sales@falconstructures.com.